Gram flour – 10 gms. Chilli powder – 1/2 tspn. Turmeric powder – 1/4 tspn. Coriander and cumin powder – 1/2 tspn. Green chillies - 3 – 4 nos. 1. Soak the chick peas in water overnight in sufficient water as the chick peas grow in size after soaking them. 2. Make a bouquet garni- in a white muslin cloth, place 2 cloves, 1/2 inch dalchini, 2 cardamoms, 1 tsp. loose tea or one tea bag and 2 peppercorns. Gather the cloth and close its mouth so that these ingredients don’t fall out. 3. Pressure cook the chick peas and the chopped potatoes with the bouquet garni and some salt.Pressure cook to 2-3 whistles or till the chick peas become tender. 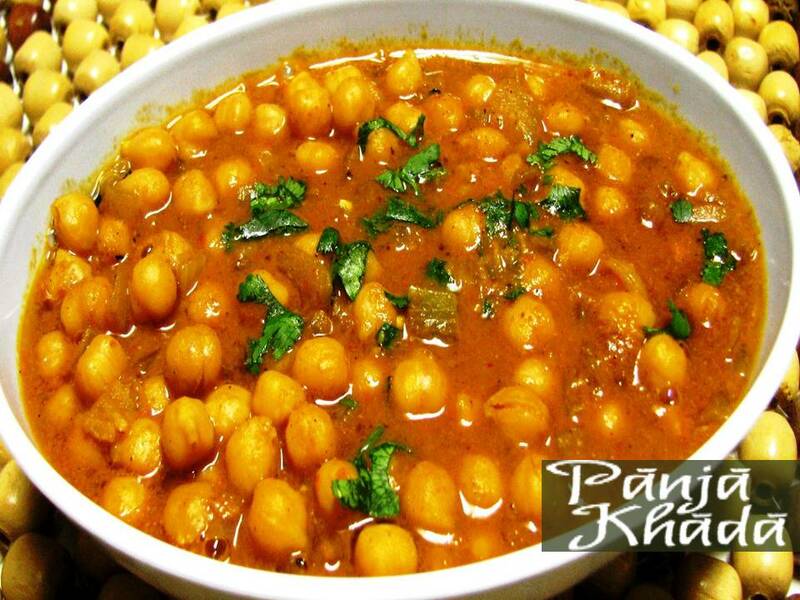 Keep the cooked chick peas aside and retain the water in which it is cooked. 4. Take a pan, add oil to it and place it on a slow flame. Then add asafoetida, keep on stirring it while adding gram flour. Stir it till it changes color to become light brown. Then add chillies, ginger, red chilli powder, turmeric powder, coriander and jeera powder. 5. Squash the tamarind soaked in water with your fingers so that the pulp gets dissolved in water. Strain this mixture and pour it in the above pan. 6. Now add the cooked channa with the retained water to the pan. Add little salt and mix it well. If required add a cup of water to it. Adjust the seasonings if required. 7. Let this mixture simmer for 15-20 minutes till the gravy becomes thick. Mash the channa a little with the kevai ( round spoon). 8. Garnish with fresh chopped coriander leaves and serve hot. 1. Finely chopped mint leaves can also be added to the channa in the last boil to add flavor. 2. Half a teaspoon of jaggery can also be added to the gravy to give it a tangy taste. Channa can be eaten with Chokha for lunch. It can be served with Puri or Phulko for dinner.